A new computer algorithm can turn thousands of random digital photos into a single 3D model. 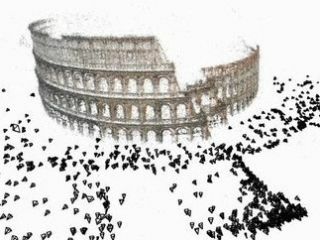 Researchers at the University of Washington in Seattle took 150,000 images of Rome from Flickr and created a virtual Rome in around 21 hours, using a cluster of 496 computers. The software grabbed images that were tagged with 'Rome' or 'Roma', then automatically correlated, sorted and matched them with one another. The new algorithm is a development of earlier work licensed to Microsoft in 2006 and released as its Photosynth service last year. But where Photosynth is limited to hundreds of photos, the new system can cope with hundreds of thousands - a task that would take years or even decades to process with Photosynth, say the researchers. The newly developed code works more than a hundred times faster than the previous version. It first establishes likely matches and then concentrates on those parts. The code also uses parallel processing techniques, allowing it to run simultaneously on many computers, or on remote servers online. This technique could create online maps that offer viewers a virtual reality experience, or be used to build cities for video games automatically, instead of doing so by hand. It also might be used in architecture for digital preservation of cities (Venice has also been digitised using over 250,000 snaps) or integrated with online maps. Check the University of Washington site for some impressive fly-throughs.